Have you been looking for a company that can help you with those Back to School products you need? I have the perfect one... and you can even personalize your products! Today, I have a giveaway for a personalized sports bag from Stuck on You, but first I want to share a little bit. Stuck on You allowed us to go in and personalize our own sports bag! We decided to personalize this for Modesty, for her to use for her Tae Kwon Do gear. Make sure you read through the post to see how we designed our sports bag in three very easy steps! For this we were debating between pink and navy blue. The pink would be pretty for a girl, but the blue wouldn't show dirt as much. We finally decided on navy blue, so that when she takes it to classes/tournament where her bag would be sitting on the floor, it won't get dirty as easily, or at least it won't show as much. As far as a design, were weren't sure whether we should put a design on or not, since this will be for her gear for TaeKwonDo classes/tournaments. After going back and forth we decided to use the "Pony Club" design, so that her bag would be more personalized (she also really likes horses). You would not believe how long it took her to decide! After looking through the different fonts, we brought it down so that there were two to choose from - Chic and Cocoa. After previewing them both, we went with Cocoa. Not as long a decision as whether to include the Pony Club design. This is what our final preview looks like! Doesn't it look great?!? Once our Sports Bag comes in, I will do another review post, so that you can see how our bag looks, how we like it, etc. so make sure you keep checking back! Here is a little bit of information about the sports bag... "A Personalised Sports Bag is a great sized bag for sports, holidays or sleepovers. When you order a bag from Stuck on You®, you will receive a durable, quality bag made just for your child. Our bags are made from quality poly canvas and are fully lined throughout. With a large dual zipper opening and extra smaller pockets including a separate shoe pocket, it is easy to fit all sorts of gear into. Carry handles can be joined together for easier one-handed carrying and a padded shoulder strap is included. Plastic stoppers on the base of the bag aid in keeping the bag off the floor which is ideal if the bag goes everywhere with your child. 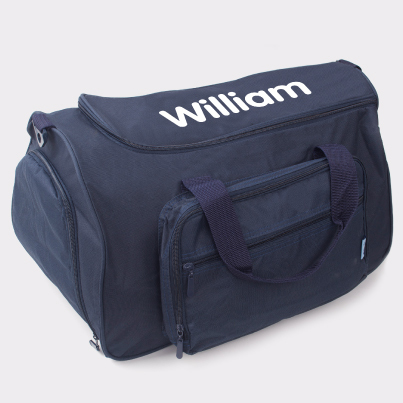 Personalise the bag with your child’s name in a choice of fonts and designs. Order securely online for a quality bag that is delivered to your door. Our Sports Bags are great for sports, travel or as a multi-purpose bag for daycare and outings with infants. With one of our designs printed boldly on the top of the bag, it is easy for kids to recognise their belongings. TIPS Ensure that wet clothing or shoes are placed in a plastic bag inside sports bag, remove and air out once you get home so that your bag remains dry and smelling fresh. For added freshness, keep an air freshener in the shoe compartment." Okay Neighbors, Stuck on You is going to give 1 of you a Personalized Sports Bag to help with your Back to School Shopping! I love the pink with the flower! I would definitely use the pink! I would choose the Navy bag with the race car design. I would choose the name only design. If I won, I might choose the design of the tree with birds in it. I would choose the red tractor design. I would want the blue sports bag with the 2 Owls and the Name centered on it in sasi font.. How cool would that be.. I would also use the horse design. Stuck on You® Sports Bag i love the pink one! I would go with Name Only in navy blue. I think that would be the best for my son. I like the flower pot design. I like the tractor - it's so cute and I'd probably choose blue. My oldest would LOVE the horse design with a red bag and the Chic font. Thank you for the wonderful giveaway! Oh I really love the construction design! Carter would love that! owl design or name only! I would choose a blue tractor bag. I would choose the Navy Bag with the Tiger. I would choose the Navy Bag with the Pony design. I like the navy bag with the name only design in Freestyle font. I would get the navy bag with the little tree & the birds. I would choose the navy bag and have the red tractor design. I would choose the astronaut/ space design. I would choose the navy blue with name only. I like the Robot design! I like just the name.